With the introduction of the N-series phones, Nokia started offering devices with advanced multimedia capabilities. N90, Nokia's first phone with Carl Zeiss optics was a hint about the company's intentions of creating a device which one day can substitute a stand-alone camera from the mid-class. With time, the top-level Nokia models have continued to use the same optics while also have developing better software and image sensors, thus raising the megapixels. The N73 came out. But Nokia decided that a 3-mega pixel resolution and brand-name optics are not the only thing, which a top-of the-line multimedia phone should be able to do. 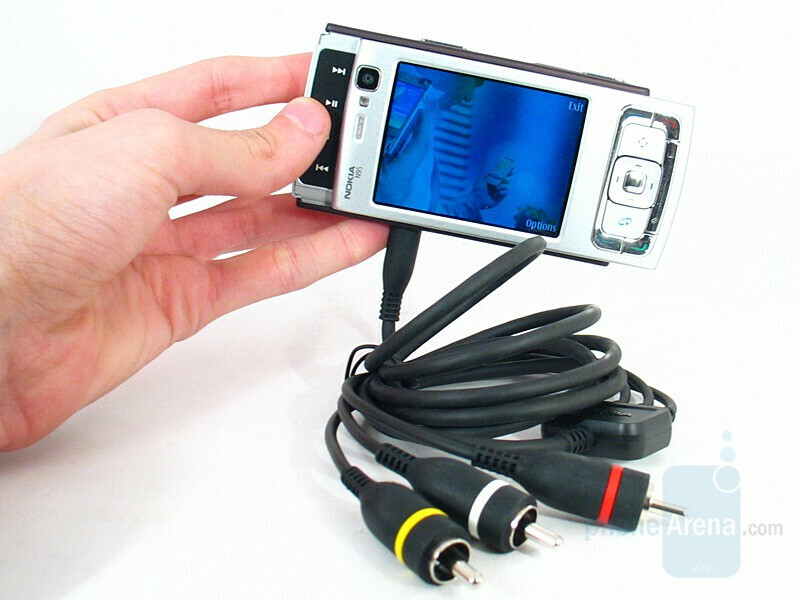 N93 demonstrated an optical proximity /zoom/ and video recording with resolution allowing “ TV quality of the picture “- 640 x 480 pixels at 30 frames per second. This turned the phone not only into a camera, which you can always bring with you, but also to a comparatively small camcorder to record those precious moments. 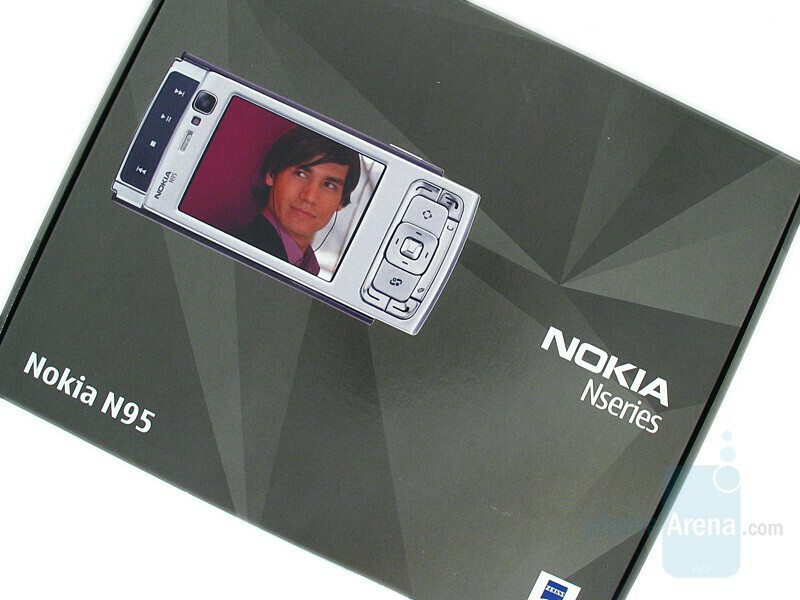 Nokia N95 is the logical heir uniting the previous models in one, making it the top-model in the line for 2007. N95 combines the positive features of a few top-models and it is a multi-functional device with standard size. For its design, the slider form-factor of the N80 has been borrowed along with with some features of the N73. The camcorder offers the same capabilities as the one in N93 and the camera is again with Carl Zeiss optics, but this time with the enviable 5-megapixels. But this is not all. 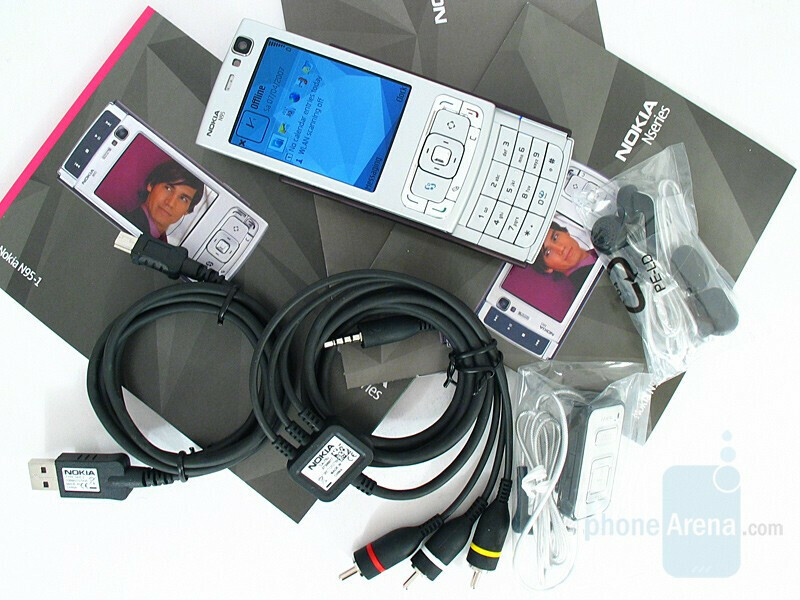 In its pocket dimensions the telephone embrace Symbian operating system typical for all Nokia smartphones and among its feature we have no choice but to mention a 3G HSPDA high-speed connection, a Wireless Lan /WiFi/ and a build-in receiver for localization (GPS). Whether N95 is really this unbelievable phone, offering so much in such small package, you will read in the review below. 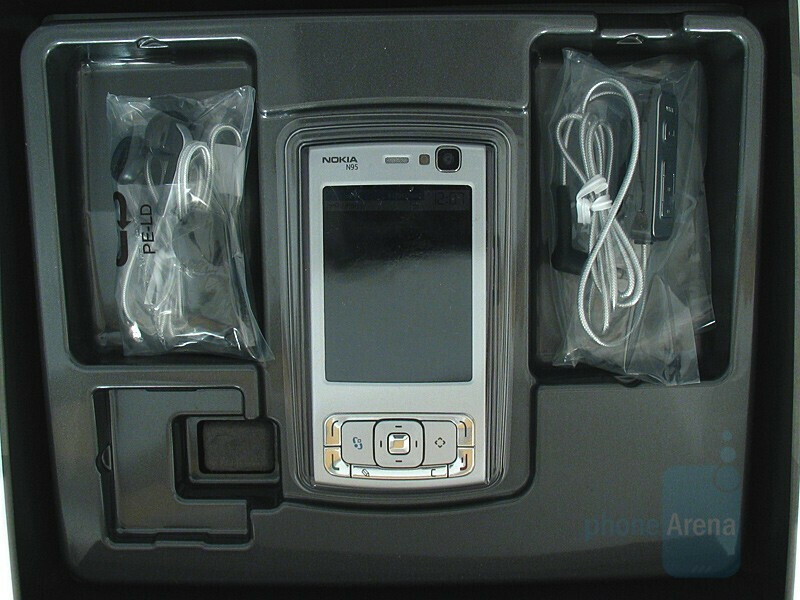 The sales package of Nokia N95 demonstrates that it is a device of the highest technological and price class. 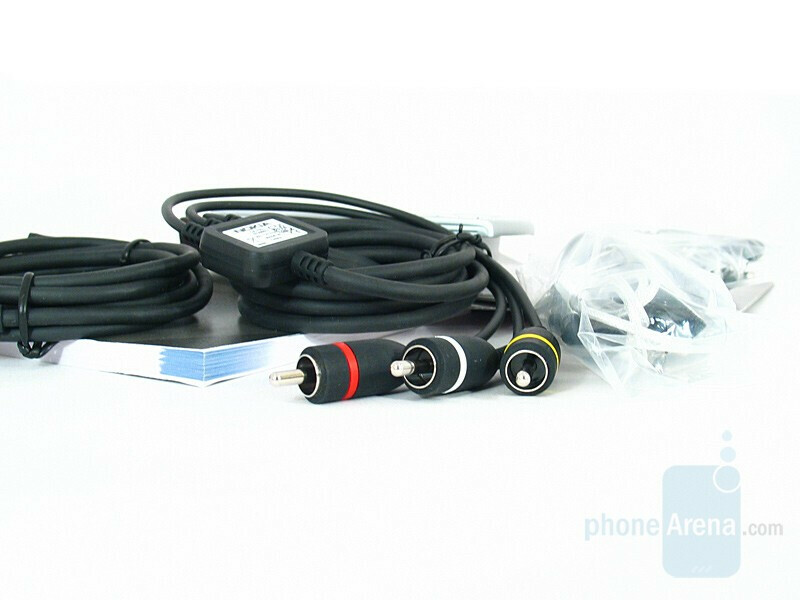 In the box you will find wired remote control controlling the music features, stereo headphones, a cable for connection to a computer and another one for connection to a TV set in order for you to view your photos and videos on a big screen. There is also a charger, user manual and a CD with software. Most boxes lack a carrying case, while the Malaysian version has a very nice leather one along in 1GB of microSD memory. I guess your A800 does not have a phone in it? what a joke! if you think an a800 takes better pictures then maybe you should take an eyesight test. The only major flaw with the N95s camera is the magenta tint and oversharpened detail. These can be fixed by firmware updates. N95 definitely the best of the best. The device got everything that a normal person to a hightech junkies wants; wifi + flawless internet browser, infrared+bluetooth connection, high-end camera, Mp3 & multimedia player, 3G connection & GPS reciever... Its only drawback for most people (including me) is the pocket-emptying price..! about 1/3 of these are coming back faulty, can be anything from battery life, software faults, loose slides or even buttons not working. on the ones that do work the battery life makes the N80 look good. oh and the GPS is rubbish. N95 nokia for my opinion is not as good as N73 because my N95 always hang and it needs to charged everyday. The service center here in Riyadh told me that they always repair N95 because of its battery life and ic connection. Please Nokia company, do action now and see the problems. who ever took those pics with N95 dont know how to take pics. Horrible. I am a former N80 owner and I've got nokia n95 for more than a week now, and i really love its performance, from the 5 megapixel camera, stereo speakers, GPS, WiFi, UMTS, dvd quality video, largest nokia screen( though lower resolution compared to N90 and N80 )etc... It's battery is lasting for about a day and a half under rigorous usage, and even longer when it is just in its standby mode. every possible connection is now a reality- from stereo speakers, to your laptop/desktop, and now, to your TV. Can anyone handle that? So stop comparing it to k800, N73 or even N93i because it's far better. To those people criticizing the phone, maybe the phone is too good or too expensive for you. But if the money is not an issue, Nokia N95 is a clear choice or rather the perfect mobile phone for you! Nokia N95 Review I've been using the N95 for a few days now. This is one hell of a cell phone. I did read a few reviews before buying the N95, obviously since it costs so damn much. A lot of people complained about the poor battery life and the slider being a bit wobbly. My friend's got an N95 and I got the N95, but both the phones have very firm sliders, even when closed, unlike the Nokia 6270 which does wobble a bit when the slider is closed. About the battery life, i think it is not as bad as others say it is. On my 1st day, the use obviously being pretty heavy since you try all the stuff in the handset, the battery lasted about a day. I think the screen brightness has something to do with it. If you reduce the screen brightness a bit, like I did, the battery will work longer. PRO'S: Excellent Camera, pretty good pics even in low light conditions. Normally with my N70, pics taken in low light environments have a lot of purple spots all over it. But these purple spots are almost invisible with the N95 in similar conditions. The cam has several options to enhance picture quality before take the picture itself. You can adjust the sharpness, contrast, light exposure, and many more and create a user defined profile for the cam. The video quality is excellent, but take a awesome amount of memory at highest settings. Good thing though, you can set you cam to take pics at 5MP, 3MP, 2MP, 0.8MP and 0.3MP and videos in VGA at 30 fps or 15fps, QVGA at 30 fps or 15fps, and QCIF at 15fps(3gp format). The screen in nice and big with a very clear and colourful display. However you may want to reduce the screen brightness a bit and keep the backlight timeout to about 15 secs if you want to increase the battery life. You can push it to the max if you don't care about battery life. The 2 loud speakers give an excellent sound output, much better and louder than my N70. The music player too has several options like equaliser, graphic visualizations, stereo widening, bass enhancer, etc. The earphones supplied give a good sound output but the bass effect is not as good as I expected it. However that's not a problem since you can plug in your personal earphones of any make or model that have a 3.5mm pin and listen to music the way you like it. The remote on the earphone adaptor looks very sleek too. I don't really need the GPS facility in the phone and have not been able to try it out as not supported by my network currently and i haven't visited the areas supporting wi-fi either. It's a plus point for those who need it though. The software response is pretty fast, compared to my N70 which is quite slow. It has a bearable time lag while opening applications, gallery, etc. It's too early to judge it right now since my 1GB card is only about 400mb full. The phone is loaded up with a lot of extra softwares which will spice up your cell. One impressive feature included in the web browser is multi-window option which i didn't have in my N70. This makes surfing a lot more fun and convenient. One thing I was very happy about is that the phone came with a 1GB card with it, even though the Nokia-Asia website shows the in-box having only a 128mb card(which i was very disappointed to hear at first). it also comes with a very classy leather cover, which is normally not included in in-box accessories. A car charger would have been great, if included[I know I'm asking for too much now:-)] Cons: Battery life, though not too big an issue, could have been better. Application Manager takes quite long to open, even though i hardly put any external softwares. The good thing is that software can be uninstalled from the main menu itself. Everytime i restart my phone, i don't get delivery reports for the first 10-15 minutes when i send text messages even though the settings show delivery reports ON. I have to wait about 15 minutes after starting it and it works after that automatically. The body of the handset looks a bit poor in quality considering the cost of the phone. Lets see how long it can go. If you put external themes that slows the cell a bit, the softwares(NOT THE PHONE) hang sometimes. Exiting it by holding the Menu key down and pressing the cancel button (c) takes very long. Very Pricey, but worth every buck you pay. Overall, in my opinion, if you got the cash...go for it!! !